One of my best friends has come for a visit from USA and I am catching up with her tomorrow. I thought of preparing an Indian delicacy which she must have missed during her stay in Philadelphia. 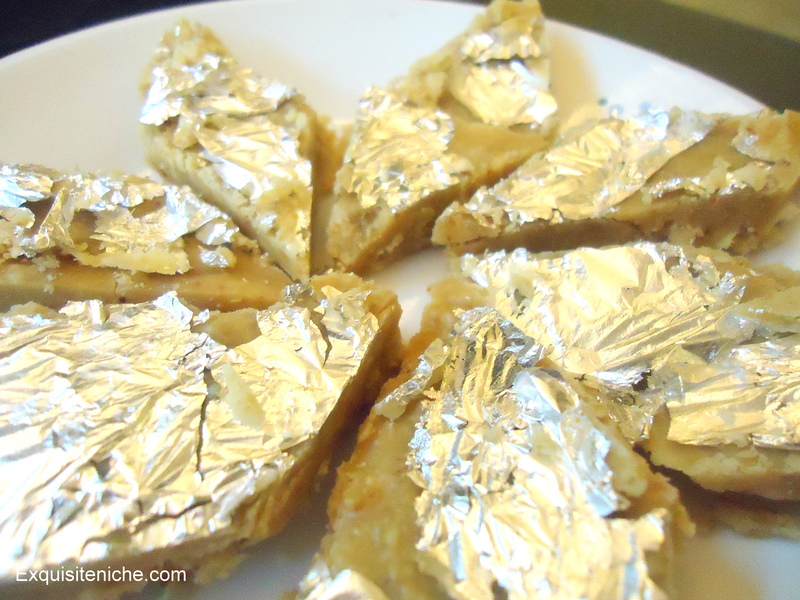 Kaju Barfi is actually one of most loved sweets by every kid. It makes great Indian desserts. It is simple yet quick. Ever since I was young, its been my favourite to0. The taste of sweet cashew is to die for. Usually I purchased it from market but this time I wanted to try at home. Grind the cashew nuts in a mixer. Heat a pan and saute cashew nut powder till it turns little brown. Heating for too long will make the cashew powder leave oil which we do not want. In a sauce pan, boil water and sugar and bring it to 1 thread consistency. Put the sugar syrup into the cashew powder. Keep stirring continuously on a low flame. Make sure there are no lumps. Add clarified butter and vanilla essence immediately. Keep stirring till it begins to leave the sides on the pan. Spread the mix quickly on a greased plate before the mix cools down. Allow the fudge to cool, then put the silver foil (varq) and cut into diamond shape. Enjoy the tempting Kaju Bafri!!! !